Feral Interactive has announced it is bringing ROME: Total War – Barbarian Invasion to iPad this March. The title is a standalone expansion pack to the critically acclaimed ROME: Total War, which was faithfully ported to iOS late last year. As with the previous Creative Assembly conversion, the iPad release of Barbarian Invasion promises a full port of the original desktop game, supplemented by intuitive touch controls, enhanced Retina graphics, and mid-battle autosaves. Barbarian Invasion is a game of epic scale, offering players a seamless integration of strategy and tactics to fight spectacular battles, while using diplomacy, subterfuge and assassination to dominate the ancient world. Featuring a campaign set in the declining years of the Roman Empire, players can either hasten its fall as a Barbarian commander or take up arms as a Roman General to extend its civilization in a glorious new epoch. 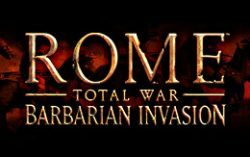 "We have been delighted by the reception of ROME: Total War on iPad and we are confident that Barbarian Invasion, bringing as it does a plethora of new tactical options, will be just as well-received," said David Stephen, Managing Director of Feral Interactive. ROME: Total War – Barbarian Invasion for iPad will be available exclusively via the App Store for $4.99. The game can be played without ROME: Total War, which is available on the App Store now for $9.99. I'd love to see Age of Empires 2 ported to iOS! It's a great game. I have RSI and can't play shoot em ups, but I like this one as I can play it slow -- and I'm into the resource type titles like Civ. However, that the expansion pack is coming is very bad news for my relationship. I've been playing the existing since it came out. In many ways it's better than the Mac version. There are occasional hangs and some odd behaviour in the late stage game (which I think pushes the iPad), but overall: really like this title. Recommended. This is great! Old games coming to our mobile devices means that consumers are gonna be nostalgic and happy and developers are going to make more well deserved money off of their great classics.